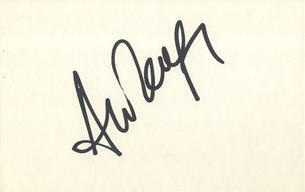 This is an In Person signed white card 5.5" x 3.5" by the Arsenal Manager who has been in charge since 1996. Arsene Wenger, OBE born 22 October 1949) is a French association football manager and former player, who has managed English Premier League side Arsenal since 1996. He is currently the club's longest serving manager and most successful, based on trophies won. After completing a Bachelor's and Master's degree in Electrical engineering and Economics respectively at the University of Strasbourg, Wenger began his short lived playing career, moving to three different French clubs in the space of eight years, the last of which being RC Strasbourg in 1981. He briefly managed top flight club AS Nancy-Lorraine, before entering a highly successful period at AS Monaco, winning the Ligue 1 championship in his first season and later the Coupe de France in 1991, along with developing young talent such as Youri Djorkaeff, George Weah and Thierry Henry. In 1995, he coached Japanese J-League side Nagoya Grampus Eight, winning the prestigious Emperor's Cup and the Japanese Super Cup a year after. At Arsenal, Wenger became the first non-British manager to win the Double in English football in 1998 and replicated the achievement in 2002. In 2004, he became the only manager in Premier League history to go through the entire season undefeated, a run which ended at 49 games. Wenger's tenure also brought Arsenal a first appearance in a Champions League final in 2006 at Paris; the team however lost to FC Barcelona late on.